I had a great time hiking and taking photos over the weekend. Rainy, cold, overcast days have most people couped up inside but those are among my favorite conditions to hike in. One reason is that there are fewer people out; it’s not uncommon to spend hours on a trail and not see another soul. I miss that sense of solitude during the warmer months when more people are out. Cool temperatures keep many people at home, but believe me – after a few minutes on the trail you’ll warm up and may even shed a layer or two. Allergic to Poison Ivy? I am, but it’s non-existent this time of year. During warmer months it’s rare to make it very far into the woods without picking up a tick (or ten). Ticks, mosquitoes, spiders, and all those other pests are wonderfully absent during winter hikes. Saturday afternoon I went to Bell Smith Springs. There were several cars in the parking lot, but once I hit the trail I didn’t see another person. While I’m as anxious as anyone for the colors of spring to appear, I found some great colors in the rocks and water here. 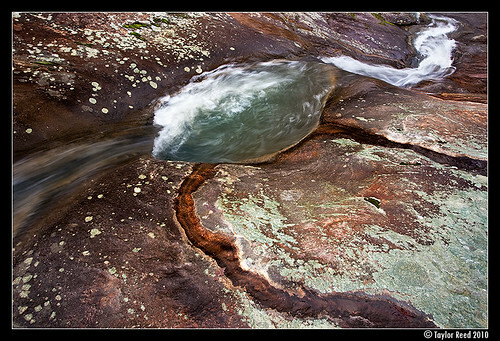 Overcast skies and rain really saturate the colors in the sandstone and streams here. 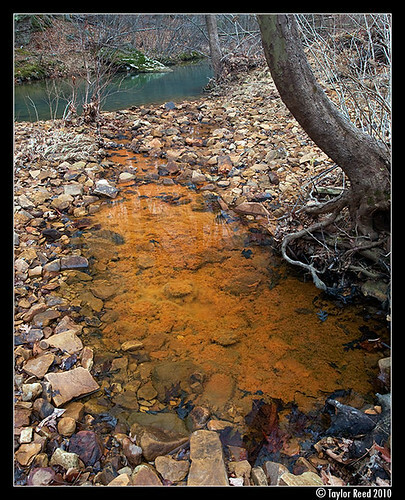 Note: This sandstone contains large amounts of iron, which precipitated into the pool as iron oxide and turned the water orange. I’ve never seen the colors in the water here quite this vibrant before. It’s remarkable how moisture, cloudiness, and a polarizer can saturate colors. These photos would have looked dull and drab if taken on a clear, dry day. They were both taken at Devil’s Backbone. I thought about hiking on to the canyon area since the water was flowing nicely, but it was getting close to dark so I called it a day. Sunday I explored an area I had never been before and it turned out to be quite a hidden gem. Hayes Creek Canyon, just outside of Eddyville, is a popular destination for horse riders. As I discovered, it’s also excellent for hiking. This is the off season for horse riding, so we were the only people there aside from the camp owners. If you go, check in at the office and they will instruct you where to park and how to get to the trail. 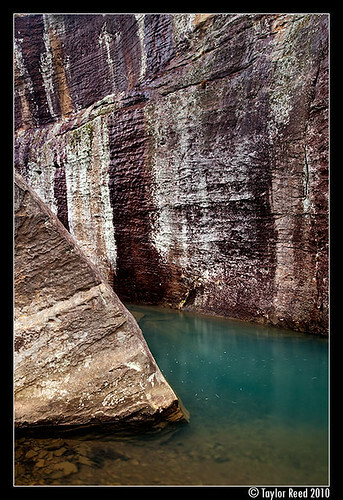 Just below the campground there is a sandstone gorge called Double Branch Hole which features twin waterfalls. 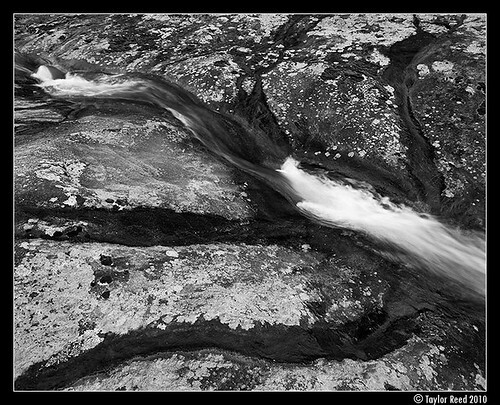 The trail follows the canyon where there are several other falls, fast flowing gorges, and plenty of great photo ops. If you continue beyond this area you have the option of hiking on to Jackson Hole, which features another great waterfall. It was getting dark so I didn’t have time to photo it but I want to revisit it soon. On the hike back I contemplated what people miss by staying inside on days like this. Someone making this same hike on a hot, dry day in July or August would miss out on the rejuvenating, even spiritual experience afforded by cool temperatures, lack of pests, solitude, and flowing water. Next time, don’t sit inside, get out and go on a rainy day hike.